This 10 Days Uganda and Rwanda Adventure highlights a prime experience at the top attractions in Uganda and Rwanda. The highlight is mountain gorilla trekking. You will get to meet both Uganda and Rwanda gorillas in Bwindi Forest National Park and Volcanoes National Park respectively. Following your arrival, a guide from our Rwanda travel company will meet you at Entebbe airport together with your driver / guide, welcome you and embark on your journey to Murchison falls national park. En-route, you may go for a visit to Ziwa rhino sanctuary and have lunch in Masindi town. Enter the park through Kichumbanyobo gate and visit the top of the falls after which you will proceed to the lodge. Dinner and overnight at Fort Murchison Lodge. You will enjoy early morning breakfast and then go for a game drive where you will spot various wildlife including elephants, giraffes, lions, Uganda Kobs among others. In the afternoon you will go for a launch cruise on the park’s main tourist attraction – the unique Murchison Falls as well as the River Nile with its streaming hippo and serried ranges of crocodile along the sandbanks, and large numbers of different species getting down to drink & bathe. Return to the lodge for dinner and overnight at Fort Murchison Lodge as above. Breakfast will be served early and embark on your journey to Kibale Forest National Park with lunch en-route in Hoima or Kagadi. This is a full day drive and you will Kibale in the evening and proceed to your lodge for dinner and overnight stay at Chimpanzee forest guest house. Wake up to an early breakfast and report to the park headquarters for briefing followed by Chimpanzee tracking. Enter the forest in search of the exuberant chimp families in the Kibale forest. Tracking chimpanzees in their natural habitat, as they swing from the branches in the canopy high above the forest floor, is a thrilling experience. Though they can be difficult to spot, you will be in no doubt of their presence as the forest is alive with their noisy calls. After tracking, you will be transferred to Queen Elizabeth national park with en-route visit to Amebere Ganyinamwiru stalagmites site including the waterfall and caves, as well as a visit to the crater lakes giving you an impressive view of the Rwenzori foothills. Proceed to Queen Elizabeth national park arriving in the evening. Dinner and overnight at Enganzi Game Lodge. 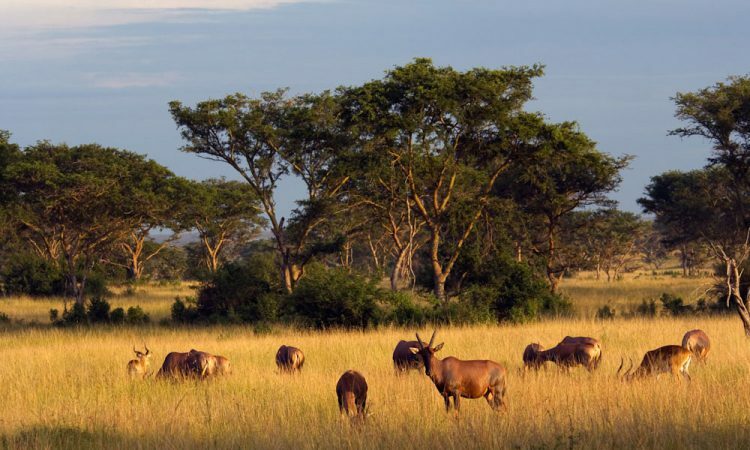 Wake up to an early breakfast and go for an early morning game drive in Queen Elizabeth national park where you will spot a lot of wildlife including African elephants, buffalos, antelopes, impala, among others and a lot of birds. Drive to the Mweya peninsular where you will have lunch. In the afternoon, go for a launch cruise along the Kazinga channel inside Queen Elizabeth Park where you will come up close with hippos, crocodiles among other aquatic life and an array of birds on the bay! Return to the lodge for dinner and overnight at Enganzi Game Lodge as above. Enjoy breakfast and embark on your journey to Bwindi impenetrable national park driving through the Ishasha sector, south of Queen Elizabeth national park where you could be lucky to see the tree climbing lions. Proceed to Bwindi with lunch en-route in Kabale town arriving late afternoon. Dinner and overnight at Ichumbi Gorilla Lodge. Have an early morning breakfast and head to the park headquarters for briefing by the ranger guides before embarking on your gorilla trek. Head into the forest and trek until you find the gorillas. Uganda gorilla trekking can take 2 to 8 hours depending on the movement of the gorillas. After finding the gorillas in Bwindi, you will be allowed only 1 hour and then return. Your driver / guide will drive you back to the lodge to relax and spend another night at Ichumbi Gorilla Lodge as above. Have breakfast at leisure and embark on your journey to Ruhengeri crossing through Cyanika or Katuna boarder and arriving Ruhengeri in the afternoon. Dinner and overnight at Mountain Gorilla View Lodge. Wake up to an early breakfast and depart with your lunch packs to the park headquarters for briefing about the dos and don’ts of Rwanda gorilla trekking. Later head into the bamboo slopes and hills of Volcanoes National Park in search of the gentle giants. Gorilla trekking can take between 2 to 6 hours in Rwanda depending on the movement of the gorillas. On finding the Gorillas, you will be allowed up to a maximum of 1 hour to view and photograph the gorillas as they go about their jungle business not minding who is watching! After the trek, return to the starting point or another point of assembly where you will be awarded your certificate. Meet your guides and transfer back to the lodge for dinner and overnight at Mountain Gorilla View lodge as above. Have breakfast and depart Ruhengeri to Kigali city where you will have a brief city tour and transfer to the airport for your flight back home.